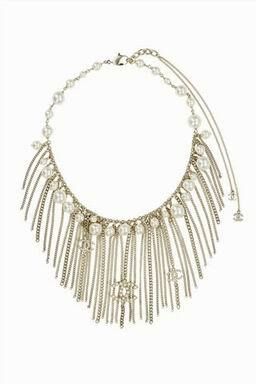 Fringe is the largest thermal elements in recent years,it seems to Chanel can not exception, the spring Starting Point series have introduced the tassel jewelry, but compared to other brands of rock and roll styles, Chanel's tassels are even more gorgeous and elegant, and it is perfectly together with brand identity. At first, gold is very gorgeous, while the light gold color are even more elegant than the golden color; sophisticated design and process have reveal the big brand quality, different sizes of thickness and different pearl decorated jewelry make the ornament more dynamic,rich layers, in particular the double C logo brooches, tassels density are changes delicate,accord with the pearl pendant. 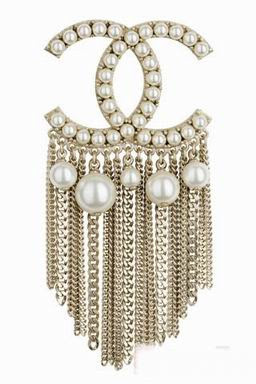 The necklace design is quite comprehensive, others tassel necklace is only pay attention to the tassel,but the Chanel chain is interval together by pearl, and at the behind there are two long logo pendant chain,it is very excellent after wearing. Chanel fringed jewelry can be match with dark suit, you can also match with brand spring and summer the cream, the white color, jewelry will not exaggerated, but the overall is radiant. Browse necklace design online at Rockrush.com.